When a certain Andrea Dossena struck a final nail in the coffin of Real Madrid in the form of Liverpool’s 4th goal and his first goal for Liverpool (and 6th overall), everyone knew that things are very wrong at Real Madrid and a major restructuring needs to be done, so that we can have some semblance in Europe. But having a semblance is not enough, we are Real Madrid. We need to reclaim our right, and what would be better than lifting La Decima at the Bernabeu in front of 85,000 rapturous Madridistas and over a million worldwide. Sounds Impossible? Maybe. But our kit makers have always stressed “Impossible is Nothing”, and we have to believe it is possible. It is possible, provided we make the right changes at the right time. The Coliseum (read Santiago Bernabeu) is in a state of neglect and we need to renovate it. Where the club needs to start is at the top level and then work its way down the bottom. And all this needs to be accomplished in 2-3 months of pre-season. When the season resumes, we need to have things and a game plan in place, else we can be sure of traversing the same road of indignity once more. Since the last 7 years we’ve had Caesars the likes of Commodus who are responsible for the downfall of our empire and advisors like Rasputin, responsible for advising an empire into extinction. What we need now are not politicians but real socios; someone who bleeds Merengue through and through. Someone who understands Real Madrid and feels for Real Madrid with the least possible political leanings. A good thing is that our election dates have been pre-poned to May, which gives us ample time to select a real leader, one who can carry the brunt of turning things around for our club. The leaders contesting for elections should have all their plans of renovation in place which they exhibit to the socios as part of their election campaign. The socios should then take a realistic call on the possible candidates, choosing only that person who has the club’s best interests at heart with a solid and realistic plan to back it up. Marca polls indicate that Florentino Perez has 91% chances of succeeding at the election campaign and I feel this is where socios take a big chance without understanding the risks involved. Even other presidential candidates are now wary of running in for the campaign. After all, why fight a battle, which is already lost? We don’t even know of Perez’s plans for renovation. He has never approached the media directly and most of the newsbytes making the rounds is pure speculation. Yet, fuelled by this speculation, most of us are ready to believe the “make-believe”. Marca has always been labeled as a Madrid bIased daily. But for all the bias, Marca has been instrumental in spoiling many things at the club and the interim club management should take pro-active steps to curb the Madrid based daily’s outlandish claims which hurt the image of the club and condition the perception of its readers and presidential contenders ahead of the election campaign. Football, over the years, has undergone a significant change and is now as much of a business as it is sport and entertainment. With all the big bucks pouring into the game from various avenues, the new breed of players tends to be mercenaries, ready to go to battle for the highest bidder. In this age and time, it’s necessary to recognize the mercenaries from real players. We do not need mercenaries playing for us. Real Madrid has always been about passion, grit and determination and mercenaries have none. We have players pocketing 5 million salaries and content to sit out on bench. We have players who joined Real Madrid because of the brand, but have done little to do justice to their inclusions. At a club like Real Madrid, you get 1-2 chances to cut it, and if you’re good enough you take those. If you’re not, you don’t. We have old horses, which simply don’t have it in them to play at the highest level anymore. Then again, we have players, who have become the crowds’ enemies and get constantly booed out. If this was not enough and if latest reports are to be believed, we have a rift of sorts in our dressing room, which doesn’t bode well with the rest of the team in the best of times. And the time is as worst as it can get. An immediate solution would be that every presidential candidate has his own realistic shortlist of players they want out, players they want to stay and players they want to get in, all subject to the coach’s final word on the matter. A useful premise for the last goal would be to look inwards first (at home talent) and then extrapolate outside, if the requisite talent cannot be sought. The other important question that candidates need to ask themselves before making their respective shortlist is, “Do we have players of world class quality, capable of turning a match?” If not (and the answer currently is a resounding NO), then we should identify the existing players who have potential to be world class, dismiss the rest who don’t and have a realistic wish list of players fitting the bill. Finally we move down to the granular level, where the problem is the most critical and glaringly apparent. The problem with Real Madrid is that years of lack of consistency, lack of planning, abundance of mismanagement, and neglect of the Castilla have made the club lose its sense of identity and thereby fall from grace down into Pot 2 of UCL with Villareal overtaking us in UEFA Rankings. The cause of all these problems is quite simple if you ask me. 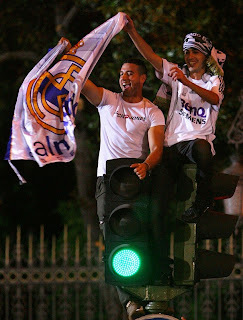 I feel that the reason that Real Madrid is where it is today, because we have lost the white from Madrid. The white is present only as a jersey color. There is no madridismo left today. Gone are the days when individuals like the great Santiago Bernabeu poured their own sweat and blood and money into the club. Instead we have individuals like Calderon who use money earned from the sweat and blood of others for their personal gains. We, at Real Madrid, need to start looking inwards if we are to right our flaws. Every single person in our club establishment should be a self confessed Madridista. We should promote our Castilla over everything else, because players bred in the Castilla are better players at Real Madrid than foreigners of the same caliber. We need to have madridistas at helms of different enabling functions like our talent scouting team, the medics’ team and the club administration. We need to have stability when it comes to coaches. As a club, Real Madrid has seen more coaches in the last 7 years than some clubs have done since their inception. We need to stop this “win something or get out” mentality. It is not possible for anyone to win every single time, how much ever we try and aspire to win. We need to get our identity back and a footballing philosophy to call our own. We need to get rid of the fanatical, radical, racist Ultra Sur from the Santiago Bernabeu. They are nothing but a bunch of fascist fanatics and we, along with football in general, can certainly do without them. Lastly, we as Madridistas need to be patient and realistic. There’s no harm in dreaming of winning, but we have to be realistic in recognizing our shortcomings and keeping our expectations realistic. We cannot allow ourselves to boo our own players in our own home ground. We cannot allow away fans to raise more clamour than us in our own stadium. Things like these undermine a team’s morale. It is the right of a fan to expect good football every single time from the team that they support, but what we should understand that it is the right of a player to expect his home crowd to cheer for the team even when all hope seems lost. The only trivial human emotion which is sustaining a million fans clamouring for improvement.